Our Village Calendar is hosted by Google. If you would like to add one or more of the individual calendars that make up this calendar to your own diary just click on the name of the calendar to download as an iCal file; alternatively, right click on the name and select “Copy Link Location” to add as an account to organisers such as Microsoft Outlook. 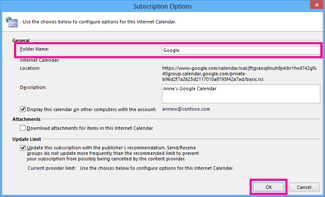 An Internet Calendar (iCal) Subscription keeps your Outlook copy of your Calendar up-to-date. Right-click the above entry for the desired calendar, and then click Copy Link Location in the shortcut menu. Note Don’t click the link. If you do, the calendar will open in Outlook as a Calendar Snapshot and won’t be updated. Click the above entry for the desired calendar. 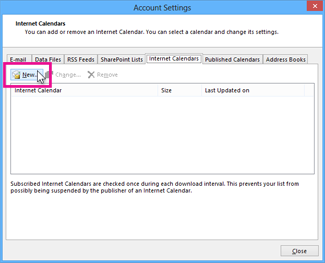 When prompted, click Open with Microsoft Outlook to import the calendar into Outlook. The calendar opens in side-by-side view in the Outlook Calendar. It’s also added to the Navigation Pane in Calendar view, under Other Calendars. If the calendar is not showing, check the box next to its name in the Navigation Pane. To merge the events with your own calendar, click on the arrow to the left of the Calendar Title. To reverse the process click again on the arrow, which now points in the opposite direction.